A rabbinical guidebook for killing non-Jews has sparked an uproar in Israel and exposed the power a bunch of genocidal theocrats wield over the government. When I went into the Jewish religious book emporium, Pomeranz, in central Jerusalem to inquire about the availability of a book called Torat Ha'Melech, or the King's Torah, a commotion immediately ensued. "Are you sure you want it?" the owner, M. Pomeranz, asked me half-jokingly. "The Shabak [Israel's internal security service] is going to want a word with you if you do." As customers stopped browsing and began to stare in my direction, Pomeranz pointed to a security camera affixed to a wall. "See that?" he told me. "It goes straight to the Shabak!" As soon as it was published late last year,Torat Ha'Melech sparked a national uproar. The controversy began when an Israeli tabloid panned the book's contents as "230 pages on the laws concerning the killing of non-Jews, a kind of guidebook for anyone who ponders the question of if and when it is permissible to take the life of a non-Jew." According to the book's author, Rabbi Yitzhak Shapira, "Non-Jews are "uncompassionate by nature" and should be killed in order to "curb their evil inclinations." "If we kill a gentile who has has violated one of the seven commandments… there is nothing wrong with the murder," Shapira insisted. Citing Jewish law as his source (or at least a very selective interpretation of it) he declared: "There is justification for killing babies if it is clear that they will grow up to harm us, and in such a situation they may be harmed deliberately, and not only during combat with adults." In January, Shapira was briefly detained by the Israeli police, while two leading rabbis who endorsed the book, Dov Lior and Yaakov Yosef, were summoned to interrogations by the Shabak. However, the rabbis refused to appear at the interrogations, essentially thumbing their noses at the state and its laws. And the government did nothing. The episode raised grave questions about the willingness of the Israeli government to confront the ferociously racist swathe of the country's rabbinate. "Something like this has never happened before, even though it seems as if everything possible has already happened," Israeli commentator Yossi Sarid remarked with astonishment. "Two rabbis [were] summoned to a police investigation, and announc[ed] that they will not go. Even settlers are kind enough to turn up." In response to the rabbis' public rebuke of the state's legal system, the Israeli Attorney General and Prime Minister Benjamin Netanyahu kept silent. Indeed, since the publication of Torat Ha'Melech, Netanyahu has strenuously avoided criticizing its contents or the author's leading supporters. Like so many prime ministers before him, he has been cowed into submission by Israel's religious nationalist community. But Netanyahu appears to be particularly impotent. His weakness stems from the fact that the religious nationalist right figures prominently in his governing coalition and comprises a substantial portion of his political base. For Netanyahu, a confrontation with the rabid rabbis could amount to political suicide, or could force him into an alliance with centrist forces who do not share his commitment to the settlement enterprise in the West Bank. On August 18, a pantheon of Israel's top fundamentalist rabbis flaunted their political power during an ad hoc congress they convened at Jerusalem's Ramada Renaissance hotel. Before an audience of 250 supporters including the far-right Israeli Knesset member Michael Ben-Ari, the rabbis declared in the name of the Holy Torah that would not submit to any attempt by the government to regulate their political activities -- even and especially if those activities included inciting terrorist attacks against non-Jews. As one wizened rabbi after another rose up to inveigh against the government's investigation of Torat Ha'Melech until his voice grew hoarse, the gathering degenerated into calls for murdering not just non-Jews, but secular Jews as well. "The obligation to sacrifice your life is above all others when fighting those who wish to destroy the authority of the Torah," bellowed Rabbi Yehoshua Shapira, head of the yeshiva in the Tel Aviv suburb of Ramat Gan. "It is not only true against non-Jews who are trying to destroy it but against Jewish people from any side." The disturbing philosophy expressed in Torat Ha'Melech emerged from the fevered atmosphere of a settlement called Yitzhar located in the northern West Bank near the Palestinian city of Nablus. Shapira leads the settlement's Od Yosef Chai yeshiva, holding sway over a small army of fanatics who are eager to lash out at the Palestinians tending to their crops and livestock in the valleys below them. One of Shapira's followers, an American immigrant named Jack Teitel, has confessed to murdering two innocent Palestinians and attempting to the kill the liberal Israeli historian Ze'ev Sternhell with a mail bomb. Teitel is suspected of many more murders, including an attack on a Tel Aviv gay community center. Despite its apparent role as a terror training institute, Od Yosef Chai has raked in nearly fifty thousand dollars from the Israeli Ministry of Social Affairs since 2007, while the Ministry of Education has pumped over 250 thousand dollars into the yeshiva's coffers between 2006 and 2007. The yeshiva has also benefited handsomely from donations from a tax-exempt American non-profit called the Central Fund of Israel. Located inside the Marcus Brothers Textiles store in midtown Manhattan, the Central Fund transferred at least thirty thousand to Od Yosef Chai between 2007 and 2008. Though he does not name "the enemy" in the pages of his book, Shapira's longstanding connection to terrorist attacks against Palestinian civilians exposes the true identity of his targets. In 2006, Shapira was briefly held by Israeli police for urging his supporters to murder all Palestinians over the age of 13. Two years later, according to the Israeli daily Haaretz, he signed a rabbinical letter in support of Israeli Jews who had brutally assaulted two Arab youths on the country's Holocaust Remembrance Day. That same year, Shapira was arrested under suspicion that he helped orchestrate a rocket attack against a Palestinian village near Nablus. Though he was released, Shapira's name arose in connection with another act of terror, when in January, the Israeli police raided his settlement seeking the vandals who set fire to a nearby mosque. After arresting ten settlers, the Shabak held five of Shapira's confederates under suspicion of arson. Despite his longstanding involvement in terrorism, or perhaps because of it, Shapira counts Israel's leading fundamentalist rabbis among his supporters. His most well-known backer is Dov Lior the leader of the Shavei-Hevron yeshiva at Kiryat Arba, a radical Jewish settlement near the occupied Palestinian city of Hebron and a hotbed of Jewish terrorism. Lior has vigorously endorsed Torat Ha'Melech, calling it "very relevant, especially in this time." Lior's enthusiasm for Shapira's tract stems from his own eliminationist attitude toward non-Jews. For example, while Lior served as the IDF's top rabbi, he instructed soldiers: "There is no such thing as civilians in wartime… A thousand non-Jewish lives are not worth a Jew's fingernail!" Indeed, there are only a few non-Jews whose lives Lior would demand to be spared. They are captured Palestinian militants who, as he once suggested, could be used as subjects for live human medical experiments. Otherwise, Lior appears content to watch Palestinians perish as they did at the muzzle of Dr. Baruch Goldstein's machine gun in 1994. Goldstein, who massacred 29 Palestinians and wounded 150 in a shooting spree while they prayed in Hebron's Cave of the Patriarchs mosque, was a compatriot and neighbor of Lior in the settlement of Kiryat Arba. At Goldstein's funeral, Lior celebrated the massacre as an act carried out "to sanctify the holy name of God." He then extolled Goldstein as "a righteous man." Thanks to Lior's efforts, a shrine to Goldstein was constructed in center of Kiryat Arba so that locals could celebrate the killer's deeds and pass his legacy down to future generations. Though Lior's inflammatory statements resulted in his being barred from running for election to the Supreme Rabbinical Council, according to journalist Daniel Estrin, the rabbi remains "a respected figure among many mainstream ZIonists." By extension, he maintains considerable influence among religious elements in the IDF. 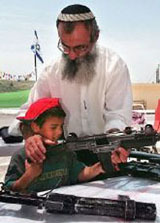 In 2008, when the IDF's chief rabbi, Brigadier General Avichai Ronski, brought a group of military intelligence officers to Hebron for a special tour, he concluded the day with a private meeting with Lior, who was allowed to revel the officers with his views on modern warfare -- "no such thing as civilians in wartime." Besides Lior, Torat Ha'Melech has earned support from another nationally prominent fundamentalist rabbi: Yaakov Yosef. Yosef is the leader of the Hazon Yaakov Yeshiva in Jerusalem and a former member of Knesset. Perhaps more significantly, he is the son of Ovadiah Yosef, the former chief rabbi of Israel and spiritual leader of the Shas Party that forms a key segment of Netanyahu's governing coalition. Yaakov Yosef has brought his influence to bear in defense of Torat Ha'Melech, insisting at the August 18 convention in Jerusalem that the book was no different than the Hagadah that all Jews read from on the holiday of Passover. The Hagadah contains passages about killing non-Jews and so does the Bible, Yosef reminded his audience. "Does anyone want to change the Bible?" he asked. Only days before direct negotiations in Washington between Israel and the Palestinian Authority planned for early September, Yaakov Yosef's 89-year-old father, Ovadiah delivered his weekly sermon. With characteristic vitriol, he declared: "All these evil people should perish from this world… God should strike them with a plague, them and these Palestinians." The remarks have sparked an international furor and earned a stern rebuke from Palestinian negotiator Saeb Erekat. "While the PLO is ready to resume negotiations in seriousness and good faith," Erekat remarked, "a member of the Israeli government is calling for our destruction." Palestinian Israeli member of Knesset Jamal Zehalka subsequently demanded that the Israeli Attorney General Yehuda Weinstein put Yosef on trial for incitement. "If, heaven forbid, a Muslim spiritual leader were to make anti-Jewish comments of this sort," Zehalka said, "he would be arrested immediately." Here was a perfect opportunity for Netanyahu to demonstrate sincerity about negotiations by shedding an extremist ally in the name of securing peace. All he had to do was forcefully reject Yosef's genocidal comments -- a feat made all the easier by the White House's condemnation of the rabbi. But the Israeli Prime Minister ducked for political cover instead, issuing a canned statement instead of a condemnation. "Rabbi Ovadiah Yosef's remarks do not reflect Netanyahu's views," the statement read, "nor do they reflect the position of the Israeli government." By refusing to cut Yosef loose, his party remains a central actor in the Israeli government. Thus the statement by Netanyahu was not only weak. It was false.